Virginia isn’t just for lovers. With its breathtaking mountains, huge state parks, and award-winning golf courses, Old Dominion has plenty to offer those who like their vacations to be extra adventurous. If you’re into hiking, biking, or climbing, then you need to check out this article. Below, we’ll explore some of the greatest tourist attractions in Virginia for people who love the outdoors. Every list of tourist attractions in Virginia must include Shenandoah National Park. This rather narrow park located within the Blue Ridge Mountains in measures almost 200,000 acres. it welcomes well over one million foreigners every year. Without a doubt, the most popular thing to do in this national park is to take a slow ride on the 105-mile Skyline Drive. This long stretch of road is actually the only way to drive through Shenandoah National Park and there are plenty of signposts along the way to let you know about points of interest. Because of the changing foliage, expect more tourist traffic here in the autumn season. This doesn’t mean, however, that Shenandoah National Park is any less beautiful at other times of the year. Indeed, many experts recommend first time travelers visit Shenandoah in the springtime to take advantage of fewer crowds and the region’s budding wildflowers. 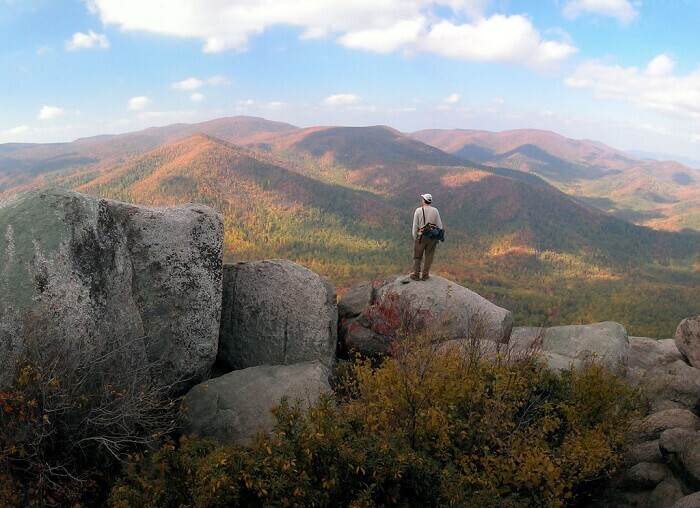 Hikers will find over 500 miles of trails to explore throughout the park, some of the most famous trails being Old Rag and Little Stony Man. For people looking for the best panoramic views, consider climbing to the 4,000-plus foot peak on Hawksbill Mountain. 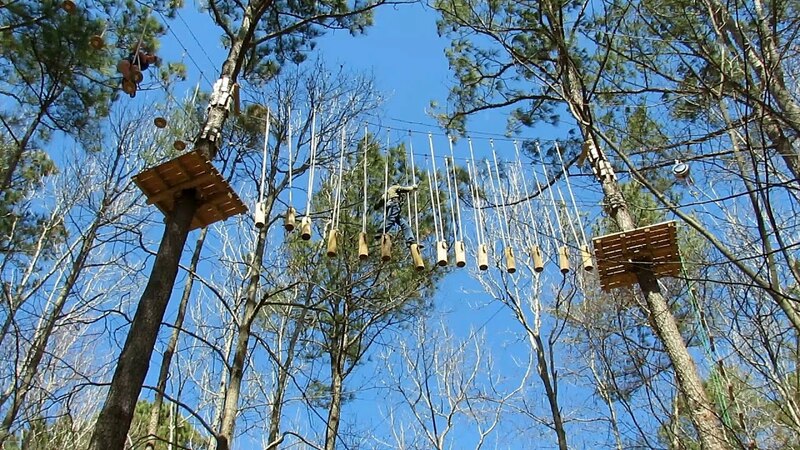 Going on a zip-line in Adventure Park‘s forest is one of the best tourist attractions in Virginia Beach for the whole family. This woodland area measures approximately six acres and is conveniently located near another great family attraction: the Virginia Aquarium. Believe it or not, there are 20 different zip-line courses to choose from at Adventure Park ranging from beginner to a massive 315 long line. Besides getting your thrills on an unforgettable zip-line, the Adventure Park has 15 hiking trails and numerous climbing opportunities. The park allows anyone above the age of five inside and can arrange specialty events like birthday parties or corporate team-building exercises. Note, this park’s hours change due to the season and weather. Always call ahead of time to be sure they haven’t closed for the day. You’ll find the entrance to this park at 801 General Booth Boulevard. If Adventure Park didn’t satisfy your adrenaline fix, then Virginia Canopy Tours in Bentonville definitely will. Just a few things included on every Canopy Tour include a UTV ride, a couple of nature walks, a rappel, and eight (that’s right, eight!) trips on zip-lines through Shenandoah Valley. Tour guides say their highest zip-lines reach about 90 feet high and the longest line is a whopping 1,035 feet. As you could see, these tours are definitely not for the faint of heart! As you’re going through this region of Shenandoah Valley with your tour guide, you’ll also get to learn more about the flora and fauna of this region and get some great pics of the Massanutten Mountains. 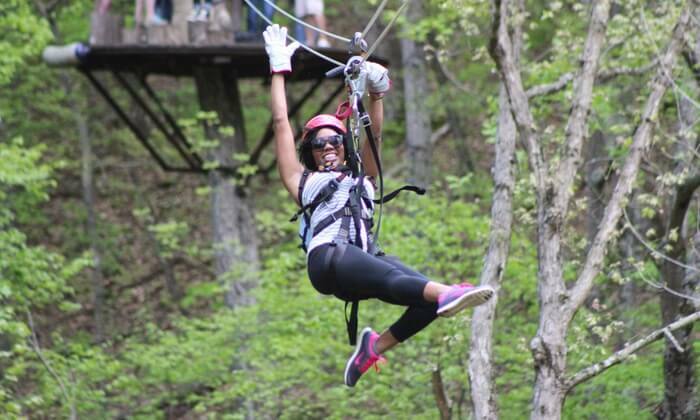 Anyone out there looking for extreme thrills in Shenandoah Valley must book a Virginia Canopy Tour. This company is headquartered in 1371 Daughter of Stars Drive in Bentonville. 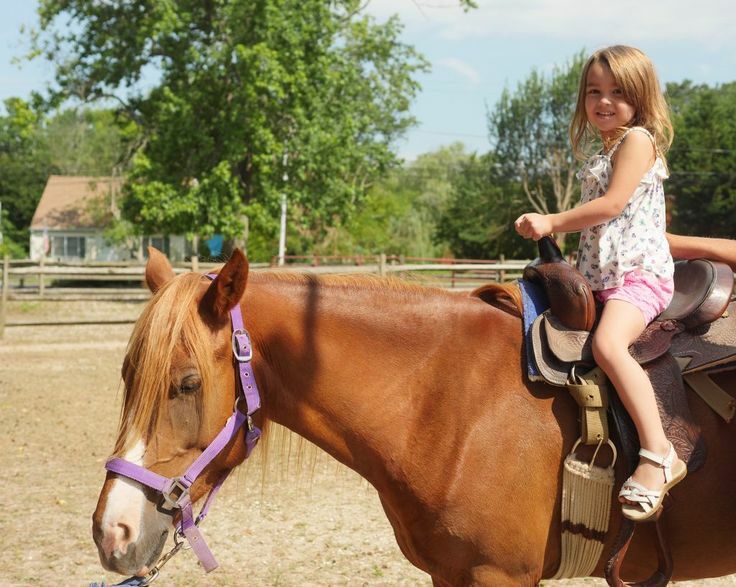 Another great place for outdoorsy families in Virginia is Chincoteague Island Pony Rides. As the name suggests, this company is located on Chincoteague Island and offers guided pony rides to children lighter than 100 pounds. All of the ponies here are well-trained and every child is helped by two safety staff members around the paddock. After your child has taken his/her first successful ride on a pony, take a walk around the Misty Museum to learn more about region’s claim to fame: Misty of Chincoteague. If you’re visiting on a weekend, be sure to stick around to see one of this company’s impressive live pony shows. You’ll find Chincoteague Island Pony Rides on Chicken City Road. If you’re into golf, then you’ll find plenty of tourist attractions in Virginia. Thanks to Virginia’s awe-inspiring scenery and milder year-round temperatures, you can find a great place to tee off in this state almost any time of the year. It also doesn’t hurt that many pro golfers have had a hand in designing Virginia’s best courses. 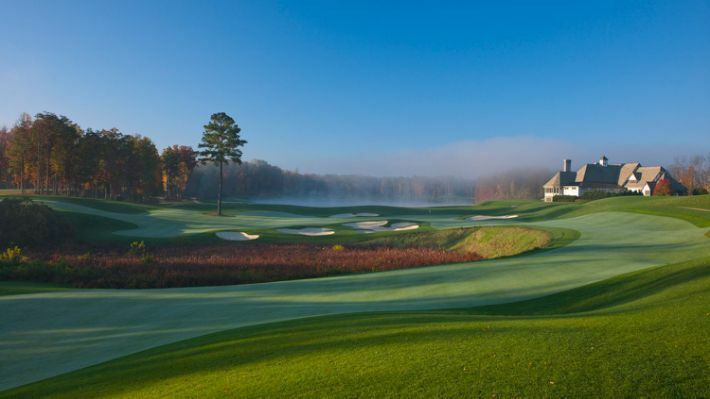 A few of the top courses in the nation that you’ll find in Virginia include Kinloch Golf Club in Manakin-Sabot, Robert Trent Jones Golf Club in Gainesville, and the Ballyhack Golf Club at Roanoke. Whether you want to go out for a day with friends or book a resort package, you should find what you’re looking for as you search through Virginia’s dozens of golf courses. Are you someone who likes the pleasures of the outdoors but doesn’t like all the hard work of hiking? If your answer was yes, why not take a relaxing voyage on a traditional Yorktown schooner? Not only is this great for people who want to relax, it’s also great for people who want to experience Virginia’s rich history first-hand. 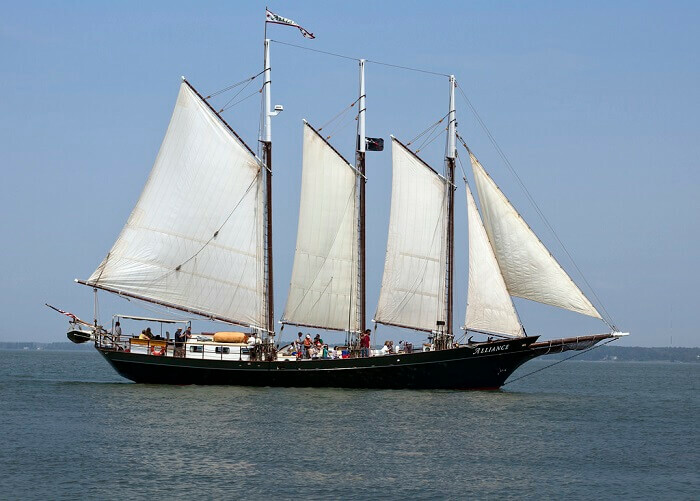 That’s right, guests actually get the chance to help these schooners’ crew members steer along the York River! As you’re sailing away you’ll get to see many historical monuments and learn about the important history of this region in the founding of the USA. You’ll find this sailing charter company at 425 Water Street, Yorktown. You just can’t escape history in Virginia, especially on the Mount Vernon Trail. 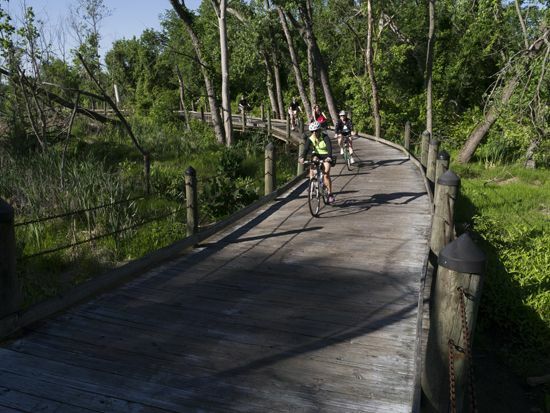 Named after President George Washington’s former home, this approximately 17-mile paved trail in northern Virginia stretches from Mt. Vernon to Theodore Roosevelt Island. The entirety of this biking trail is along the Potomac River, so you’ll get many impressive views of Washington, D.C. and you’ll even pass by Arlington National Cemetery. Just so you know, this trail is officially open from 6AM to 10PM (weather permitting) every day of the week. There are many parking spots along the trail and you can bring your pets. Trust us, this is one bike trip you’ll remember for the rest of your life! Virginia’s capital Richmond is one of the most frequently visited cities in the state. 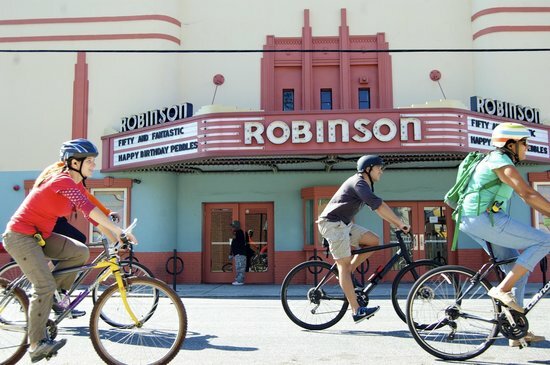 For outdoorsy people coming into this city, why not book a fun bike tour with Richmond Rides? Local guides who work for Richmond Rides will lead you all around the most significant areas of the former capital of the Confederacy and tell you fascinating stories about Richmond’s rich past. From the Colonial era to the present day, you’ll gain a greater appreciation for this significant city and get your daily exercise. Plus, you’ll get to taste some of Richmond’s world-renowned cuisine along the way! What’s better than that? When people think of tourist attractions in Virginia, they often only think of the state’s historical sites. Hopefully this list of tourist attractions in Virginia has convinced you that there are plenty of different outdoorsy things every nature love can enjoy. Whatever intensity-level activity you’re into, you’ll find some way to make it happen in Old Dominion.